Figuring out how to plan a surprise birthday party is not hard, but does take some additional planning beyond a typical birthday party. With the covert nature of this party, take special steps to avoid the surprise from becoming a letdown for everyone involved. The very first step in planning a surprise party is to determine whether the party is one that the guest of honor will appreciate or dread. It is easy to get caught up in the excitement of planning the party and forget to figure out whether it is the type of party that the birthday boy/girl will enjoy. 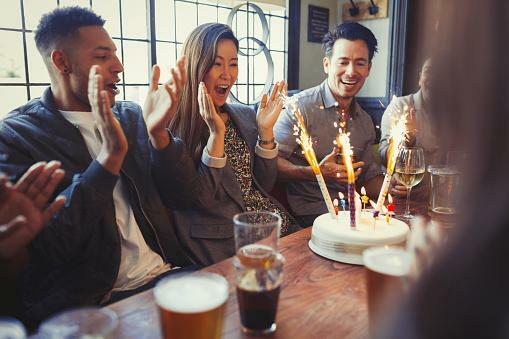 For example, sociable college students might find a 21st surprise birthday party exciting, while others who are introverted may be mortified at the thought. Keep yourself organized for the surprise by keeping a party planning checklist or outline. Include all the pertinent information in this list, including contact names and numbers. Use the steps provided below for making how to plan a surprise birthday party easy. Set a date - Casually ask friends and family members about the actual birthday date and the days surrounding the birthday date. Only mention the surprise party idea to a few trusted people who will not mention it-the longer the information is known and the more people who know it, the more likely it is that someone will let it slip. Consider co-conspirators - Asking others to help cuts down on the amount of work you are obligated to do for the party, but also opens up the risk for outing the surprise. Ask just a couple people to help with planning or getting the birthday boy/girl to the party. Create a story - The most important, and difficult, step of planning a surprise party is the creation of the story that will get the birthday boy/girl to attend the party without raising suspicions. 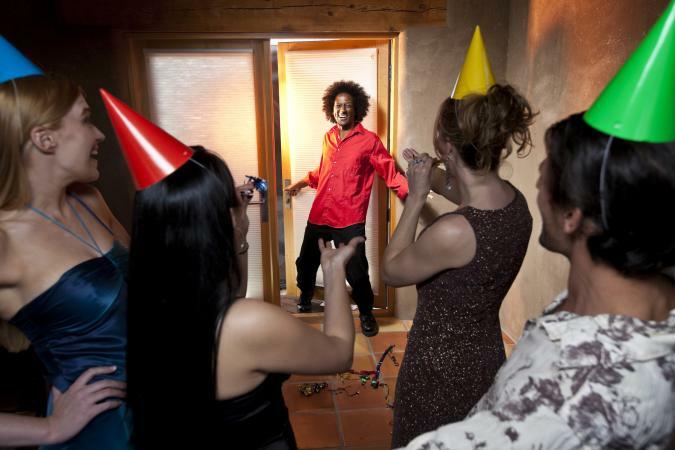 Consider asking the guest of honor to a smaller soiree or create an alternate event to attend several days after the birthday day to keep suspicions to a minimum. Involve important family and even other friends if necessary, but only those who need to know. Find a location - The party location for the surprise depends upon the story created for getting the celebrant to the party. For example, if you are planning a small dinner with close friends, use the restaurant's party room for a larger surprise party. Someone's home is another great idea, but think twice before using the guest of honor's home-after all, they may not appreciate everyone in their home without first cleaning it themselves. Send invitations - Send guests surprise birthday party invitations several weeks before the event. Make sure that the surprise element is in large, bold lettering. In fact, mentioning the secret several times in your surprise invitation wording is a good way to emphasize the secretive part of the event. Remember to have everyone arrive 30 to 60 minutes before the guest of honor. Gather decorations - Pick up birthday party supplies that are festive and fun. Just because it is a surprise party doesn't mean you cannot add another party theme, such as a luau or even a walk through time theme. Choose entertainment - The type of entertainment you get depends on the party budget. Mingling over food and drinks with some background music is simple and cost effective, while a larger budget allows for a hired band or even a DJ. Kids might enjoy a clown, magician, or even some animal guests! Plan the menu - Decide whether to host a party menu yourself with homemade foods, a caterer, or a mix of purchased foods and homemade dishes. Do not forget to include both non-alcoholic and alcoholic beverages on your shopping list. Once the party day arrives, it is important that everyone knows what he or she is doing and when to do it. Double-check your timeline with those who are getting the guest of honor to the party. Arrive at the party location to decorate about an hour before guests arrive and have the food ready 15 minutes before guests show up. Watch for the arrival of the birthday boy/girl and then shout "surprise" with the rest of the guests when he/she walks through the door. Bowling alley - Invite the birthday boy or girl to go bowling, or if you have a regular bowling day, consider having the party then and there. Museum - If the birthday person is an art or history lover, consider holding the party at a local museum and inviting them to see an exhibit or collection. 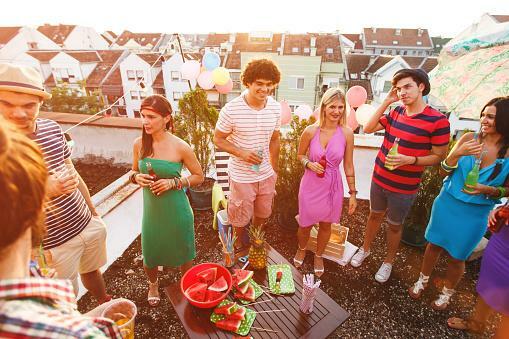 Rooftop - A budget-friendly, fun place to host a surprise party is the rooftop of your apartment building or condo. Be sure you clear it with your building supervisor first, then set up chairs, tables, and lighting! Football field - Draw the birthday boy or girl to the field by offering to throw the ball around, but surprise them instead with a gathering of all their friends and family. Get permission from the school or area recreation board prior to planning a party on the field. Campgrounds - Campgrounds are a great place to have a surprise party because the host can arrive early (even the night before) to set-up. The birthday boy or girl may think that they are going on a simple camping trip, but will be surprised when they see their friends gathered. If an overnight location isn't available, most campgrounds have shelter houses and buildings you can rent that are near playgrounds and rec areas. Hotel room - If the party is for your significant other, make them think that they are going to spend a romantic night together, but surprise them with a party! Then, after the party, resume your romantic plans. Be sure you rent a suite so everyone can mingle comfortably. Swimming pool - Instead of a simple day of swimming at the pool, surprise someone with a fun, pool party. Be sure bring anything the birthday person would need to feel presentable for photos after the swimming ends (make-up, hair brush). Limousine - A limousine is one of the best places to hold a surprise party. Have the limo pick up guests before picking-up the guest of honor. Pull up to surprise the guest of honor who will be even more surprised when they step into the vehicle to see their friends inside. Have the driver take the celebrant on a tour of his/her favorite places or even childhood memories! Sportsplex - Head to your local sports center for ice skating, basketball or soccer and invite the birthday boy or girl to go with you. Invite friends and family to meet you there. The beauty of this type of location is that you will automatically have entertainment options for your guests. Office conference room - Surprising a co-worker? Book the conference room out for "meetings" and secretly decorate and hide guests. Library - Many libraries have conference or meeting rooms that can be reserved by phone or online. Tell the birthday boy or girl you need to return some books or have to do some quick research in order to get them into the building for their big surprise! Don't let the fun end with the initial "SURPRISE!" Be sure to add other surprise elements into the party to keep the excitement going throughout the day or night. Video slideshow - Create a video slideshow including short video clips from friends who couldn't make it to the festivities and photos of the guest of honor, all put together with a special song. Play the video as a surprise to the birthday boy or girl. Surprise guest - Invite a long lost friend of distant family member as a special, surprise guest. This can end up expensive and not everyone can travel on short notice, so plan ahead. Special treat - If the birthday person has a special bakery or cafe that makes their favorite treat or meal, consider having that establishment cater your party. It's even more of a surprise if the bakery or cafe is from a hometown that the birthday boy or girl has moved away from. Adorn it with all the bells and whistles so your friend or family member knows it's a special treat. Bucket list activity - If you know the guest of honor well enough, you may know of an activity that he or she has on their bucket list. Try to incorporate that into your surprise party. Birthday boy always wanted to sky dive? Host the party near the airport and arrange for him to go sky diving. Has the birthday girl been longing for France? Give her French lessons as a gift. Performance - If you are a dancer, singer, or performer consider creating a special dance or writing a song for the honored guest and surprising them with a performance. 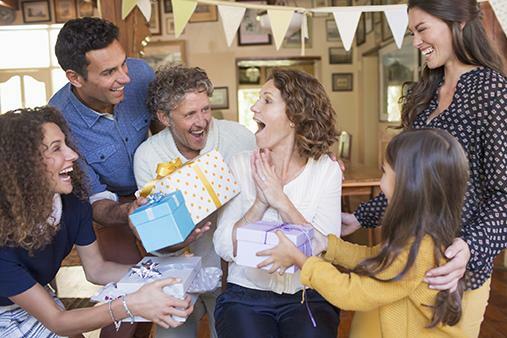 Epic gift - You may not be able to afford an epic gift for the guest of honor on your own, but consider asking guests to contribute money towards one large gift from everyone. Even that trip to the spa, the new gaming system, or the new car might be within reach if everyone goes together on the perfect gift. Progressive party - Keep the surprises coming all night long by making your party progressive. Surprise the guest of honor at his or her favorite bar for cocktails with a few friends, then move onto a secret restaurant location for dinner with another group of friends. End the night at a third surprise location for cake with yet another group of pals. Scavenger/treasure hunt - Send your loved-one on a scavenger hunt or treasure hunt that leads them to some of their favorite places and finally ends at the party venue where all the guests will have gathered for the big surprise. Gift an hour - Keep the birthday boy or girl in suspense by presenting them with a gift every hour of their party. Start off small, with a small box of candy, and progressively increase the values of the gifts, ending with the most expensive or most sentimentally significant gift of all. Costume party - Ask guests to come in a disguise, especially one that hides their face, so even after the big "SURPRISE!" moment, the birthday boy or girl will have the fun of determining the identity of the guests. This idea would work best around the fall of the year when guests have easy access to Halloween costumes. If costumes aren't a practical request, consider having guests hold masks of the birthday person's face in front of their own. The biggest problem facing people who plan a surprise birthday party is that the guest of honor finds out the big surprise. If this happens, consider doing one of two things: ask the person to act surprised, or rework the party for another date to keep it a surprise. A back-up plan is an excellent idea for other elements of the party, too. For instance, have extra drinks and easy fast party foods in case you run out, and have a few CD players ready in case the entertainment does not work out.